Jerian Grant gets the nice feed to Aaron Gordon who gets the tough shot to fall. Nikola Vucevic scores 21 points, grabs 14 rebounds as the Magic defeat the Knicks 115-89. 2017-18 SEASON: Played in 74 regular season games (26 starts) with Chicago, averaging 8.4 ppg., 4.6 apg. and 2.3 rpg. in 22.8 minpg….Ranked fourth in the NBA in assists-to-turnover ratio (3.84, 342/89) and 34th in assists…As a starter, averaged 9.8 ppg., 6.3 apg. and 4.0 rpg. in 29.8 minpg….Led (or tied) the team in scoring four times, in rebounding twice and in assists a team-high 33 times…Scored in double figures 26 times and had 20+ points three times, including a career-high 24 points on Nov. 26 vs. Miami…Dished out 10+ assists five times, including a career-high 13 assists on Jan. 22 @ New Orleans…Recorded five double-doubles…Pulled down a career-high-tying eight rebounds on Nov. 4 vs. New Orleans and Feb. 9 vs. Minnesota…Recorded a career-high-tying five steals on Apr. 6 @ Boston…Logged a career-best 47 minutes on Jan. 22 @ New Orleans in a double overtime contest…Had eight DNP-CDs. PROFESSIONAL CAREER: Appeared in 213 regular season games (60 starts) during his NBA career with New York and Chicago, averaging 6.6 ppg., 3.0 apg. and 2.0 rpg. in 18.7 minpg….Also played in five career playoff games (two starts), averaging 3.2 ppg. and 1.0 apg. in 10.4 minpg…. 2015-16: Played in 76 games (six starts) during his rookie campaign with New York, averaging 5.6 ppg., 2.3 apg. and 1.9 rpg. in 16.6 minpg.…Scored in double figures 13 times. CAREER TRANSACTIONS: Selected by Washington in the first round (19th overall) of the 2015 NBA Draft…Draft rights traded from Washington along with a 2016 second round draft pick and a 2019 second round draft pick to Atlanta in exchange for the draft rights to Kelly Oubre Jr. (Jun. 25, 2015)…Drafted rights traded from Atlanta along with a traded-player exception to New York in exchange for Tim Hardaway Jr. (Jun. 25, 2015)…Traded from New York along with Jose Calderon and Robin Lopez to Chicago in exchange for Derrick Rose, Justin Holiday and a 2017 second round draft pick (Jun. 22, 2016)…Played with Windy City of the NBA G League (2016-17)…Traded by Chicago to Orlando as part of a three-team trade; Orlando traded Bismack Biyombo and two future second round draft picks to Charlotte; Charlotte traded Timofey Mozgov to Orlando and Julyan Stone to Chicago (Jul. 8, 2018). Played in 119 career games (117 starts) during four seasons at the University of Notre Dame, averaging 14.6 ppg., 5.8 apg., 2.9 rpg. and 1.47 stlpg. in 36.4 minpg…Named consensus First Team All-America in 2014-15…Only player in Notre Dame history with more than 1,700 points, 600 assists, 150 steals and 30 blocks…Finished his career ranked third all-time in school history in assists (690), fifth in games started (117), fifth in steals (175), ninth in three-point field goals made (179) and 11th in points scored (1,739)…Scored in double figures in 99 of his 119 career outings, including 25 games with 20+ points…As a senior (2014-15), played and started in 38 games, averaging 16.5 ppg., 6.7 apg., 3.0 rpg. and 1.66 stlpg. in 37.1 minpg.…Led the Fighting Irish to an ACC Championship and a trip to the NCAA Elite Eight…Named First Team All-ACC, was ACC Tournament MVP and was one of five finalists for the John R. Wooden Award as the National Player of the Year…Ranked seventh in the nation in assists and set a single-season school record with 253…During his junior campaign (2013-14), played and started in 12 games, averaging 19.0 ppg., 6.2 apg., 2.5 rpg. and 2.00 stlpg. in 35.6 minpg….Was not enrolled at the university during the spring semester…As a sophomore (2012-13), appeared in 35 games (34 starts), averaging a team-high 13.3 ppg., 5.5 apg., 2.9 rpg. and 1.26 stlpg. in 36.3 minpg….Named Second Team All-Big East…During his freshman season (2011-12), played in 34 outings (33 starts), averaging 12.3 ppg., 5.0 apg., 2.9 rpg. and 1.29 stlpg. in 36.2 minpg….Named to the Big East All-Rookie Team. 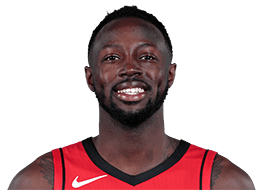 Full name is Holdyn Jerian Grant…First name is prounced JARE-in…Born in Silver Springs, MD…Second of four siblings…Older brother, Jerai, played at Clemson, younger brother, Jerami, played at Syracuse and was 39th overall pick in 2014 NBA Draft by Philadelphia…His youngest brother, Jaelin, played at DeMatha…Father, Harvey, played 11 NBA seasons (1988-99), while uncle, Horace, also played 11 NBA seasons, including six-plus with Orlando (1994-99, 2001-02)…Graduated from Notre Dame with a degree in sociology… Holds an annual basketball camp during the summer in South Bend, IN…Was a high school teammate of Victor Oladipo while at DeMatha…You can follow him on Twitter: @JerianGrant.